The new ETM magazine tube has a “ramped” front edge to prevent nose-up malfunctions against the feed ramp. Gone are the days of 9mm reliability woes in the 1911 platform. 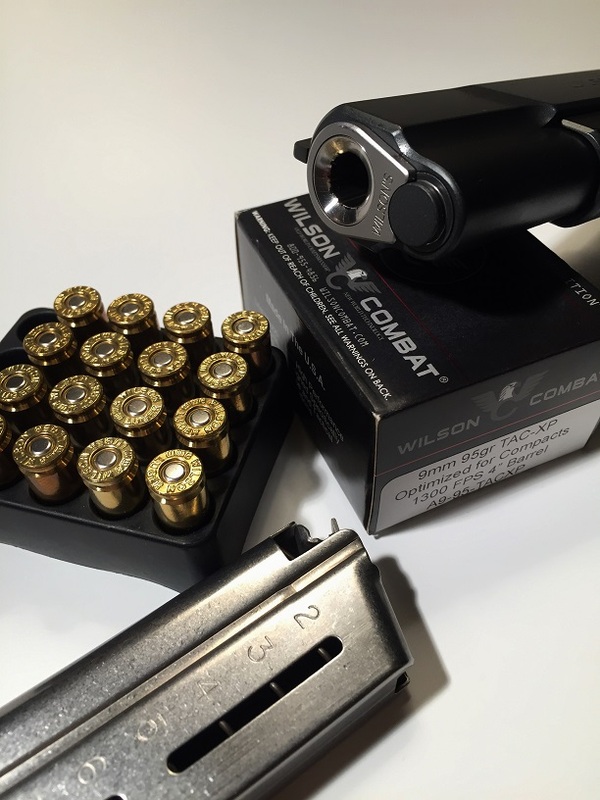 Wilson Combat has just released their next-generation magazine for 1911’s chambered in 9mm, and it is pretty impressive. Rather than regurgitate what the press release says, here are my thoughts after personally running a box of ammo and then some (a BOX, not just a box) through these magazines leading up to the release. In one sentence: I can’t make them fail. 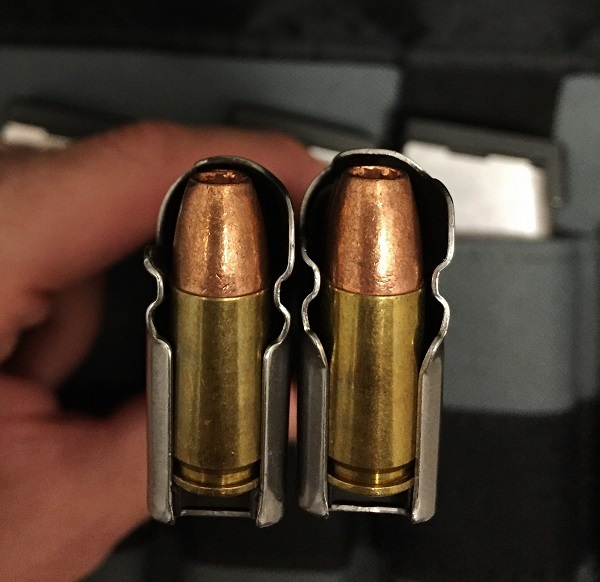 At right, the same Black Hills 115 grain Barnes load has a lot more breathing room in the new ETM magazine than the old version (left). A common problem with 9mm 1911’s, as anyone who shoots them frequently well knows, is that the correct recoil spring rate is sometimes too light to strip the top round of a fully-loaded magazine reliably if the nose is “sharp” at the front of a JHP cavity, the OAL is longer than “normal,” etc. I have found that the issue is largely resolved with a flatwire recoil spring, but even so, longer rounds with wide-cavity or flat-nosed bullets like the Barnes TAC-XP (Black Hills new production is the longest load I have on hand) will occasionally muck with the first round and cause a nose-down jam into the feedramp. 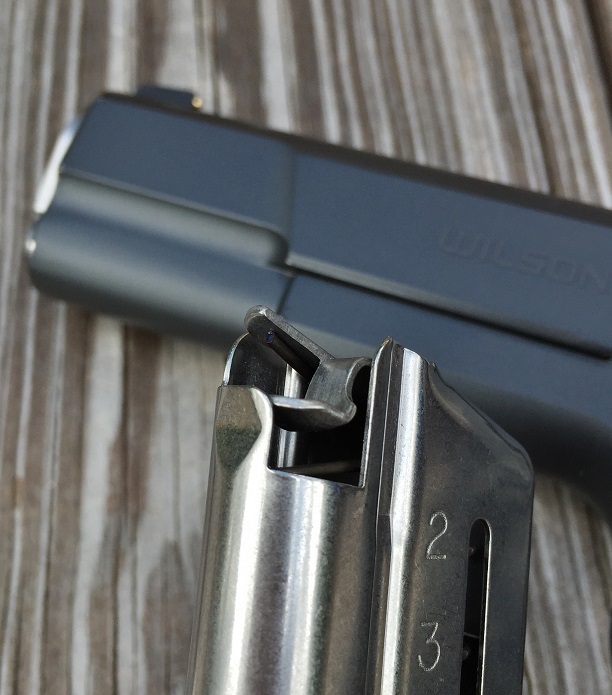 Wilson completely redesigned the magazine tube to incorporate a slight “ramp” at the front edge that should prevent this type of jam from ever occurring. In testing, even when I stepped down to lighter conventional recoil springs instead of the ~12 lb flat spring that I typically run in my 5″ 9mm, I could not get rounds to cause a FTF malfunction of this sort (or any other sort). 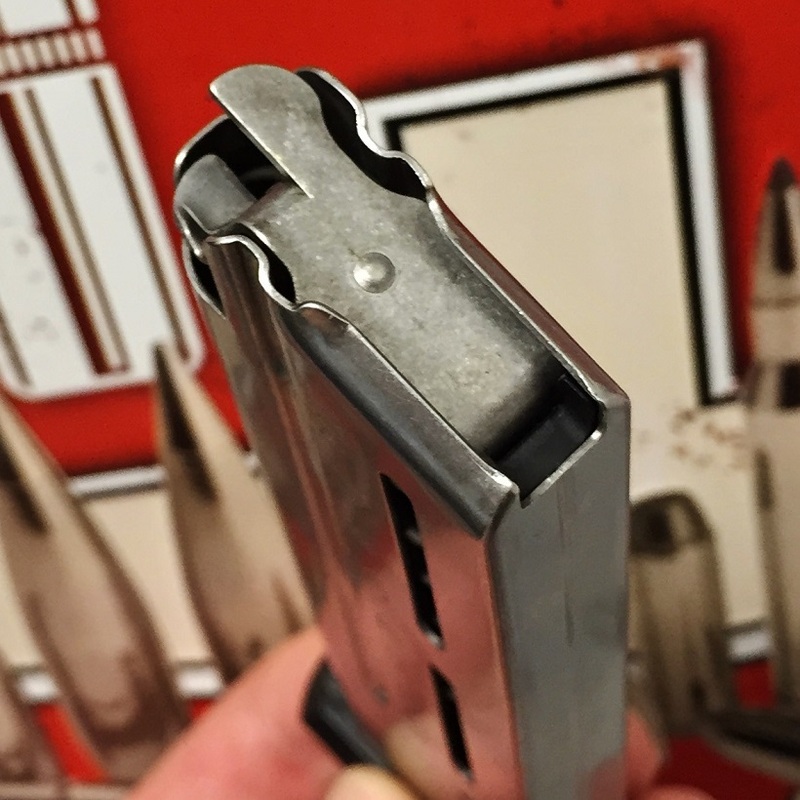 Moreover, Wilson also redesigned and thinned the spacer at the back of the magazine to provide more room for these longer or wide-nosed rounds to get started up the ramp in the first place. Although that takes care of the beginning of a string of fire, the end of a string can have the opposite problem in 9mm 1911s with slide stops that aren’t quite fit properly or even those that are properly fit if the follower is just a little bit worn out. So Bill Wilson decided to incorporate a metal follower in these new magazines to prevent failures to lock back on empty. You certainly won’t wear this follower out! And it also has a last-round retention dimple to prevent any inertia feed issues that could happen (albeit rarely) without it on a slick metal follower. 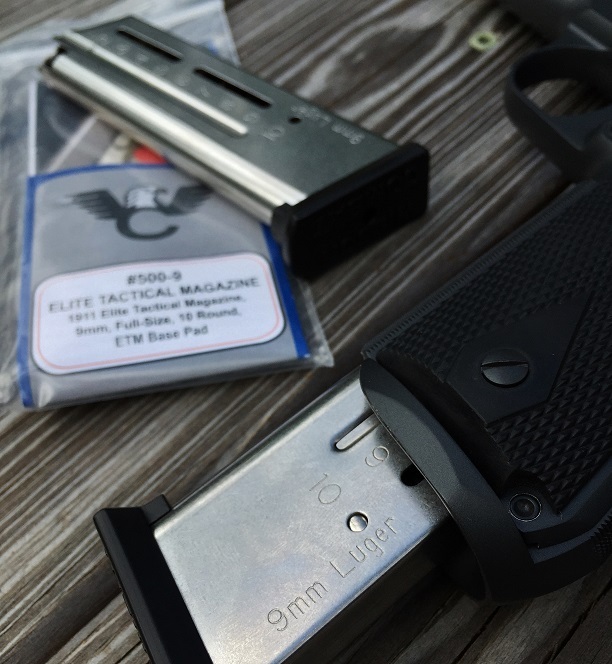 These new ETM magazines also seat very easily on a closed slide, which is always a plus as long as it isn’t at the sacrifice of spring longevity. And based on the fact that Bill Wilson personally ran over 10,000 rounds throughout the development of these magazines—not including the thousands of rounds that Wilson’s pro shooters probably logged as well—I seriously doubt that spring longevity will be an issue. But if it ever is, Wilson’s no-risk service policy is hands-down one of the best guarantees in the industry, so you certainly shouldn’t ever worry about it. The addition of numbers and a caliber designation on the 9mm feed tube is also something I welcome because although it would be kind of hard not to notice you were grabbing the wrong-caliber magazine, I like the markings on the .45 ETM magazines I have and I’m happy to see the same look on the next-gen 9mm version. *Special thanks to Wilson Combat for a pre-release sample of these bad boys for review purposes.